All living organisms utilize both exogenous and endogenous cues to regulate their metabolism, growth and development. Plants, given their 'fixed in the ground' (sessile) nature are especially sensitive and responsive to their environment and exhibit highly plastic developmental programs. Unlike animals where the body plan is established almost entirely during embryogenesis, plant form and function is mostly elaborated post-embryonically. This dominance of post-embryonic patterning and growth affords plants the plasticity they need to modify their growth, morphology and behavior to even subtle and rapid changes in their environment. Because environmental inputs are numerous and ever changing, responsiveness of an organism is highly integrated, where multiple input signals are 'sorted' and transduced in an efficient manner to give rise to proper adaptive responses. Our laboratory is interested in understanding such integrated signal-response systems from molecules to functional ecology, and employ Arabidopsis thaliana as a model for most of our studies. Two adaptive responses we are particularly interested in are: 1) phototropism, or the directional 'movement' of plant organs towards or away from direction light, and 2) prevention of polyspermy during plant reproduction. Phototropism is a classic example of plant 'movement' that is both robust and rapid, and is genetically amenable in Arabidopsis. Our studies have shown that the plant utilizes multiple photosensory pathways to monitor the light environment, and that these pathways are integrated with a number of endogenous hormone response pathways to elicit an adaptive phototropic response. Our current research foci on phototropism include: understanding how the primary phototropic photoreceptor, phototropin 1, initiates signal transduction; unraveling the role of protein ubiquitination in early signaling events; determining the transcriptional outputs of the signaling process and how their encoded proteins affect physiological outputs; developing a 3D temporal-spatial map of the phototropic response system in planta; and elucidating how phototropic responses impact plant ecology and evolution under natural conditions (in collaboration with Dr. Candi Galen). Plants, like animals, reproduce sexually and must therefore control gamete interactions to produce a proper zygotic genome. One mechanism by which this is accomplished is to prevent polyspermy, or fertilization of a single egg by multiple sperm. While much is known about how polyspermy is prevented in animal systems, little is known mechanistically about this process in plants. 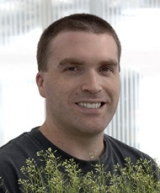 In a collaborative project with Dr. Steve Alexander (MU-Biological Sciences) we have recently found that in the absence of particular lipid metabolites, whose production are dependent upon enzymes encoded by the male genome, the block to polyspermy does not occur. We are currently focused on understanding how such metabolites affect the communication between male and female genomes during normal and aberrant fertilization at both molecular and cellular levels. 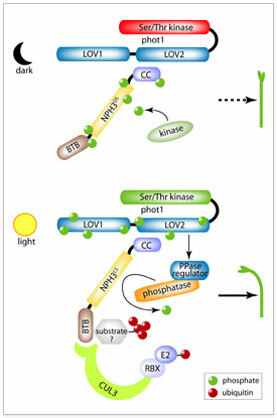 Model for early phototropic signaling via control of NPH3 phosphorylation state. Results presented here show that NPH3, a protein required for all documented phototropin-dependent phototropic responses in Arabidopsis, exists in two states depending upon the light condition: a phosphorylated form in darkness, NPH3DS (top portion of model); and a dephosphorylated form in BL, NPH3LS (bottom portion of model). It appears that NPH3DS represents the phototropic signaling incompetent state, while NPH3LSis capable of transducing phot1-percieved directional BL cues leading to phototropic responses, likely through the action of a Cul3-based ubiquitin ligase complex of which NPH3LS is part. NPH3 is apparently phosphorylated by a currently unidentified protein kinase, whose action on NPH3 is in opposition to a BL- and phot1-activated PPase, most probably a PP1. While it has not yet been experimentally determined how phot1 regulates the PPase acting on NPH3DS, it is hypothesized that it occurs via an influence on an allosteric regulator of the PPase. Holland JJ, Roberts D, Liscum E. (2009) Understanding phototropism: From Darwin to today. Journal of Experimental Botany 60(7):1969-1978. Stone BB, Stowe-Evans EL, Harper RM, Celaya RB, Ljung K, Sandberg G, Liscum E. (2008) Disruptions in AUX1-dependent auxin influx alter hypocotyl phototropism in Arabidopsis. Molecular Plant 1(1):129-144.